Photo courtesy of M. Purcell. 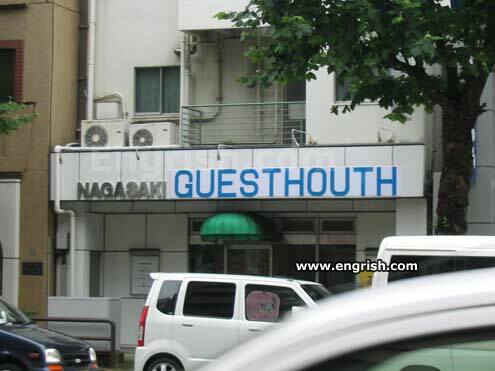 Guesthouth found in Nagasaki, Japan. Any guest stays for dinner, a free glass of wine and a chocolate moth will be on the houth. Nith beths to sthleep in at a rethonable prithe. Conveniently located and affordable; thtaff theemed dithconnected; continental breakfatht was adequate; checkout time theemed a bit early; we gave it only 2 Thtarth. Engrish doth tumbleth from the mouth. In north, west, east and south! No, the conthierge dothe not have a lithp. Why do you athk? They don’t advertise. They rely on word of mouse. It is conveniently located in 21th threet. BEWARE of thinewriteers who lithp. Sylvester’s favorite place to stay! Various guesthrooms offered for. No fethuses, thou. 1. Keep islenth of manners. 2. Before come into the guesthouth please for the room pay. 3. If thou have things in the room stay. 4. The thoilet musth keep claen. 5. Don’th walk outh to nigirt. Recommended by four out of five Igors. Houth? Do they make us cut open a tonton with a ligthsaber when we sleep at night? You must have a formidable nigh life if you’re thaying there. Dammit, Yoshiko, the signmakers screwed up! It’s supposed to say “gueththouth”! Perhaps it’s a yous hothtel. Pleath don’t make nathty commenth. It ithn’t funny. ….afther all, they have a buthneth to run……. You should see the one in Fukusaki!